ABOVE: One of several gates in the brick walls that surround the Cimitero di San Michele. In a city where the water table lies almost at ground level (and sometimes above), disposing of the dead has never been as simple as digging a grave and covering the body or coffin with dirt. And in Venice, a city with limited real estate, just finding enough room for departed citizens has always been a challenge. After the fall of the Venetian Republic in 1797, the Napoleonic authorities decreed that bodies would no longer be buried within the historic center. 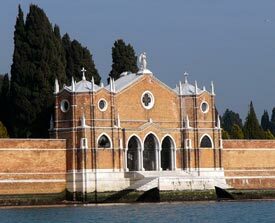 Instead, the dead were dispatched to a new walled cemetery on the island of San Michele, which is within a gondola's rowing distance of the city's northern waterfront. The island is attractively landscaped, with tall cypress trees and a 15th Century church with a cloister that leads to the cemetery proper. Most of the shallow graves that you see are occupied for just ten or twelve years; after that, the graves are excavated and the bones are transferred in boxes to mausoleum niches or dumped into a communal ossuary. During your visit, take time to see the Protestant and Orthodox cemeteries, which are less formal and more neglected than the Catholic sections. You'll find graves of 19th and 20th Century foreigners, including celebrities like Ezra Pound, Serge Diaghilev (whose grave is normally decorated with a ballet slipper), and Igor Stravinsky. For more about San Michele, see "To Die in Venice" on our main site. Take the No. 4.1 or 4.2 motoscafo from the Fondamenta Nove water bus stop on the northern edge of the historic center. The ride to the Cimitero stop takes only six minutes.